Boston Handmade and the Cristina Hurley Gallery are gearing up for a Handmade Holiday celebration this Saturday, December 22nd from 3-7pm at 554 Washington Street, Canton, MA 02021. Join us for refreshments and some end of the season shopping and be sure to have the most original holiday present for everyone on your list. As if that’s not enough, we’re giving away a FREE gift for one very lucky partygoer. Simply print our party announcement (http://bostonhandmade.org/HolidayGallery2012HandmadeCollection.htm) and bring it with you for a chance to win the 2012 Handmade Collection with work created by five gallery exhibitors. 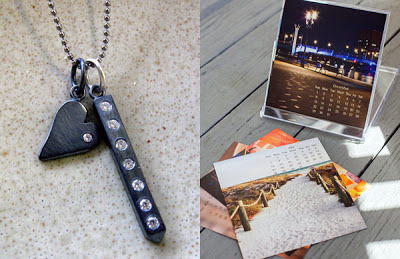 An oxidized Sterling Silver necklace with cubic zirconia, as pictured above, created by Cristina Hurley. A 2013 Desk Calendar, as pictured above, featuring photography by Lucie Wicker. An original photograph printed on watercolor paper and hand stitched to drawing paper by Jessica Burko. A pair of one-of-a-kind fingerless gloves made from upcycled woolen sweaters by Sharon Fischer. A lattice work beaded bracelet by Liz Stewart of Lush Beads. Be a Handmade Hero this holiday season by supporting neighborhood businesses and local artists. See you Saturday!